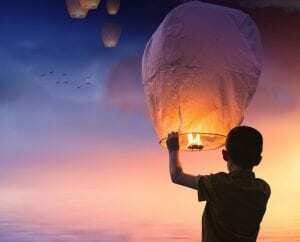 2019 Chinese New begins on February 5 and 6 and lasts for 15 days. To learn the history of Chinese New Year visit this site, and here. 2019 is the year of the pig. 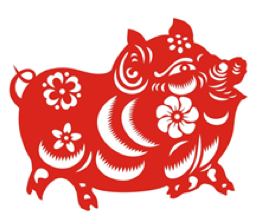 In the Chinese Zodiac, there are 12 animals, and the pig is the last one. Do you know why? Click here for the story, and a wonderful video from Taiwan. 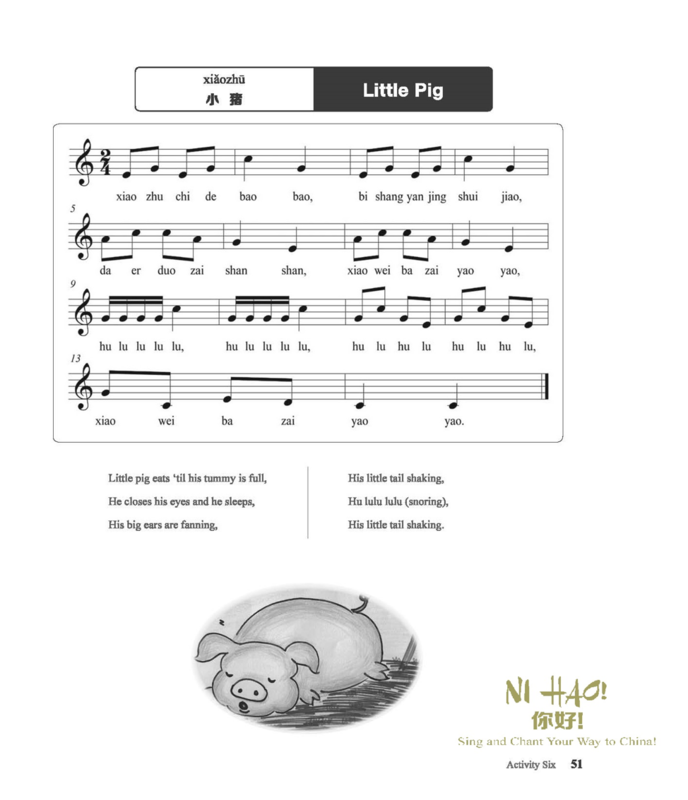 Inform the students that in China, the sound that a pig makes is “hu-lu-lu,” not “oink oink” as in the United States. Ask students to make a gesture to show the fat and round piggies, then piggies waking up. Ask students to jump around, and then make a gesture of smiling. Teach the students how to wish each other happy new year with the “gong xi” gesture (see below). Speak the chant, and ask the students to make the motions as discussed above. 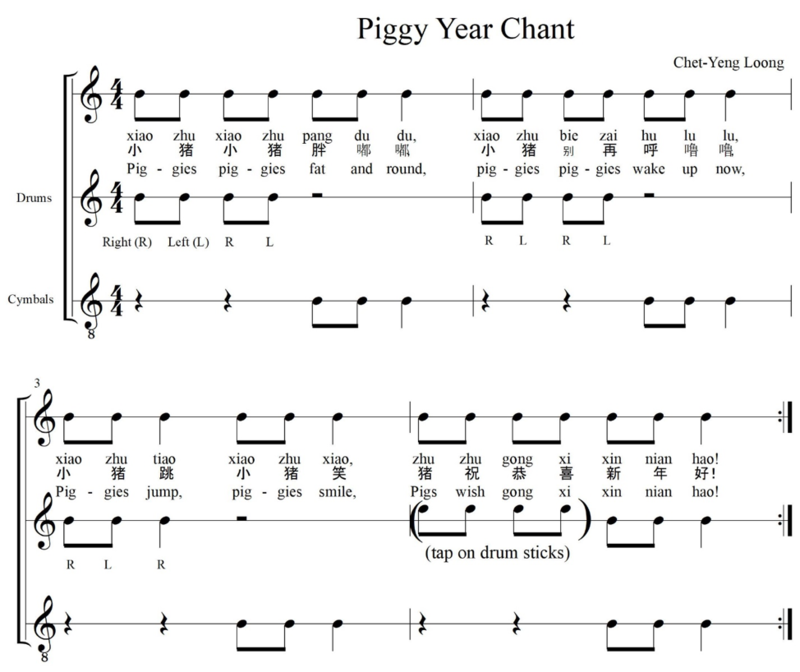 Since the chant is written in a foreign language, teachers may use the video to help the students learn the lyrics. Teachers and students should watch the video multiple times. The teacher demonstrates tapping both pointer fingers together for the words, “zhu zhu gong xi” (mm 4) and stomping right-left-right for “xin nian hao” (mm 4). Students imitate. The teacher speaks the chant from mm 1 to 3, students tap their pointers for “zhu zhu gong xi”, and stomp both feet for “xin nian hao” in mm 4. Instruct them to clap “pang du du” (mm 1), “hu lu lu” (mm 2), and “xiao zhu xiao” (mm 3). Both groups: Stomp on “xin nian hao” (mm 4). Transfer first group’s body percussion to drums, playing on the drums with sticks for the pats and tapping sticks for the pointer fingers. Transfer second group’s body percussion to cymbals. Speak the chant and play the instruments. Final presentation: Mouth the words and play the whole chant on the instruments. Kelly M. believes Studio 49 instruments are the best quality and they have the best sound!